In this chapter we consider the problem of managing the storage space optimally at a warehouse for storing cuboidal boxes in cuboidal compartments. Footwear manufacturers face this problem for storing shoe boxes; drug companies manufacturing medicines packed in cartons cuboidal in shape face the same problem, etc. Typically, warehouse management problems involve continual storage and retrieval (issues) of goods from the warehouse. Therefore, a scheme is required to handle the dynamic storage and retrieval of goods optimally from the warehouse. 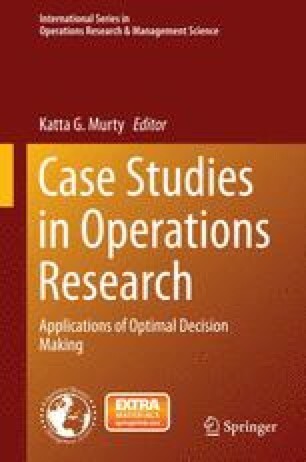 In this chapter we will discuss an efficient procedure for developing a decision support system for the dynamic warehouse management problem. The source for this chapter is based on the work done by Das and a subsequent paper by Murthy A. L. N.
The online version of this chapter ( 10.1007/978-1-4939-1007-6_12) contains supplementary material, which is available to authorized users.